600g. PROTEIN COFFEE formula has no sugar added and contains high-quality whey protein coffee with caffeine! 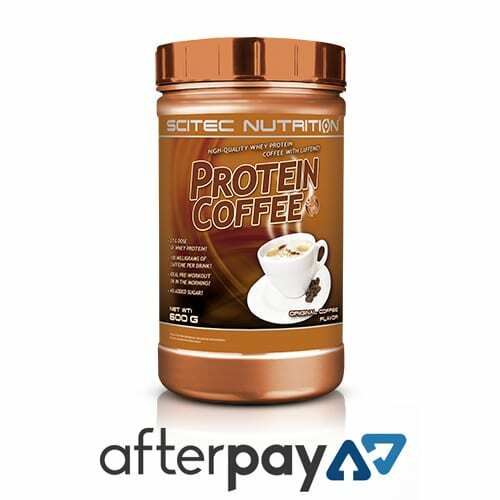 SCITEC NUTRITION’S PROTEIN COFFEE formula has no sugar added and contains high-quality whey protein coffee with caffeine! It provides an effective 27 g dose of whey protein with 100 mg of caffeine combining the two popular sports supplement ingredients. Whey protein from milk is a so-called complete protein, because it provides the body with all necessary amino acids, including the 9 amino acids (i.e. Histidine, Isoleucine, Leucine, Lysine, Methionine, Phenylalanine, Threonine, Tryptophan, Valine) that are considered essential for life, because the body cannot synthesise them. Determination of the nutritional efficiency of protein in the diet is in most cases based on estimating the extent to which dietary protein nitrogen is absorbed and retained by the body and is able to balance daily nitrogen losses. Net Protein Utilisation (NPU) is the percentage of ingested nitrogen that is retained in the body, and the Biological Value (BV) gives the percentage of absorbed nitrogen that is retained. Biological Value is the product of NPU and digestibility. Whey protein has good digestibility and amino acid composition, thus its Biological Value is great compared to other dietary protein sources like meat, fish, eggs or soy. Dietary proteins are the source of nitrogen and indispensable amino acids, which the body requires for tissue growth and maintenance. Therefore, PROTEIN COFFEE’s protein contributes to the maintenance and growth of muscle mass and also to the maintenance of normal bones. PROTEIN COFFEE provides caffeine from coffee and from added pure caffeine. Instantised Whey Protein Concentrate (from Milk, Emulsifier: Soy Lecithin), Instantised Coffee (Emulsifier: Soy Lecithin), Fat-Reduced Cocoa Powder (10-12%), Milk Powder, Sodium Chloride, Caffeine Anhydrous and Sweetener (Sucralose). The Supplement Stop recommends heating 300 ml water to approximately 60 Celsius (microwave at 850 Watts for a minute), then add 1 serving (40 g) of powder daily and stir until dissolved. However, if you’d prefer to drink it cold, like an iced coffee, that will work just fine. For best results, we recommend using PROTEIN COFFEE in the morning and before training. We do not recommend consuming it after 5pm as it will impact your sleep.